Africa is the next stop on the Zombie World Tour. This film is not easy to find, even on Netflix. I don’t remember who recommended it, but I could only find it when I searched on the director, not the title. It was so worth finding! This is one of the better zombie movies I’ve seen. It hits all the traditional notes, and is very Romero-ish, but is so well made it didn’t strike me as worn or trite. Set in Africa, the opening sequence is very good and sets the tone for the rest of the film. There is no dialogue for several minutes, and I would estimate nearly two thirds of the film has no dialogue. Even the making-of featurette is bare bones and almost no dialogue. Watch the credits to the end and you will see a shout out to please donate to the orphanage they used as a set. There is, apparently, a commentary by the filmmakers Messrs. Ford, but only on blu-ray. I got the DVD, though, so I can’t comment on the commentary. One of the Fords also acted in the film and died well. Lots of screaming. Probably half the sparse dialogue was screaming. part of Africa are pretty are made of mud, hiding in a house is not feasible. Travel is difficult, even with a vehicle. There’s literally nowhere to hide. So the film is all about the spiritual, physical, and metaphorical journey and the message that we should all get along – or else. In another nod to the origin myth there was a deleted scene on the disk that explained all people who died were reanimated, not just the ones who are bitten. There is only a bad guess as to why, and it’s acknowledged as a bad guess. For once the military is not the bad guy. In their rare appearances they’re ruthlessly doing work that needs to be done, with no obvious enjoyment or menace to the living. There were even rival soldiers banding together, which in Africa is quite the statement of how bad the situation is. I kept waiting (cynically) for someone to try and take advantage of the situation. Reminded me of watching (the British tv show) Survivors and waiting for the dead to rise. 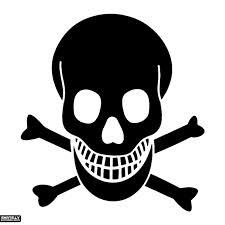 Couldn’t find movie poster or images so settled for the classic skull and crossed bones.